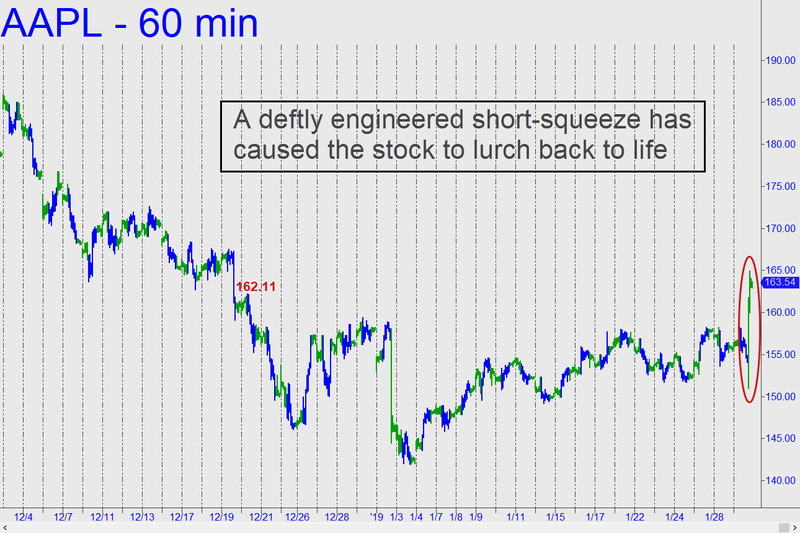 Yesterday’s commentary suggested keeping a close eye on AAPL because the stock has looked so awful lately. When you catch yourself thinking a stock has nowhere to go but down, that’s when you should prepare for it to explode. Which is exactly what Apple shares did tonight, on news that the company’s earnings have “stabilized”. This morsel of non-news did the job it was designed to do, triggering a short-covering panic after the close that has pushed AAPL to 164.85 — more than $10 above its intraday low. This works out to a gain totaling more than a billion dollars. It’s safe to say that nearly all of it went into the hands of institutional thimble-riggers who have sought the perfect opportunity to unload this dumpling ahead of its eventual plunge below $100. I won’t rehash all of the problems that have caused AAPL to fall from $233 in early October to a bear-market low so far of $142. Suffice it to say, the company has no new killer products or apps to offer consumers, and their exorbitantly overpriced iPhones — up to $1500 for the latest model — will face increasingly aggressive competition from Asian manufacturers. A U.S. recession would deliver the coup de grace, turning what until recently had been the world’s most valuable company into a salvage case. But any such day of reckoning has been postponed by tonight’s rocket rally. It easily exceeded a prior peak at 162.11 where I’d said the technical picture would turn from full-on bearish to moderately bullish. It will also turn the FAANGs and a few other lunatic stocks feisty enough to push the broad averages higher, perhaps significantly so, for at least the next few days. At some level, a bear market that had begun to look like a given could conceivably sparkle like a cave wall salted with fool’s gold. As is our wont, however, we’ll continue to insist that the rally is a hoax while acknowledging that with enough pyrite, it could mutate into the real McCoy. DaBoyz are that clever, and we should never doubt their ability to manipulate stocks so that everything that seemed to be weighing on the market just a week or two ago becomes a vague memory. AAPL has a combination of huge daily revenues and obscene gross profit margins. Without a recession there’s only so far it can go on the downside no matter what their business looks like. Share price relative to the 200 day MA works quite well…..down in the low 70s worst case for the ratio, as a percentage. Around 74 percent back on January 3. It can go lower, but that takes a recession which is still out there over the horizon.